Healthy Chocolate Peanut Butter Muffins- moist and delicious, these muffins taste just like chocolate cake. You would never guess that they’re made without dairy, gluten, oil or refined sugar! I’ve been dying to share these incredibly delicious muffins with you guys for weeks now but I wanted to wait until the time was just right. Because I know as soon as January 1st arrives, we’re all on the Eat Healthier Train and that immediately makes chocolate muffins seem like the devil. But if you’re like me and can only go so long without having chocolate in your life (cough, like 12 hours, cough) then by now you’re probably craving it like something serious. Well don’t you worry because these Healthy Chocolate Peanut Butter Banana Muffins are the perfect solution to all of your problems! Okay, I’m being a little dramatic. They might not be able to solve ALL of your problems but maybe a few? Like hunger, for starters. Rolled Oats: Whole grain rolled oats are the base of these muffins which packs them with a hefty punch of fiber and a serving of plant-based protein. Rather than spike your blood sugar and leave you crashing, they’ll keep you energized for at least a few hours. Be sure to use certified gluten-free oats for allergies! Unsweetened Cocoa Powder: Because chocolate. Baking Powder, Baking Soda and Salt: these offer leavening to help the muffins rise while also adding a hint of salt for flavor. If you’re using salted peanut butter, you should leave out the added salt. Bananas: Ripe bananas provide moisture and natural sweetness. Creamy Unsalted Peanut Butter: Natural peanut butter provides a wholesome source of fat. Also, is there anything better than the combo of banana, peanut butter and chocolate? Eggs: As much as I love flax and chia eggs, they just don’t leaven like real eggs. If you want puffy muffins like you see in the photos then you’ll need eggs for this recipe. Vanilla Extract: While not completely necessary, vanilla extract ties everything together and lessens the need for refined sugar. Pure Maple syrup: Provides moisture and natural sweetness. See possible variations for substitutions. Unsweetened Almond Milk: This is what I always have on hand but any kind of milk will work. 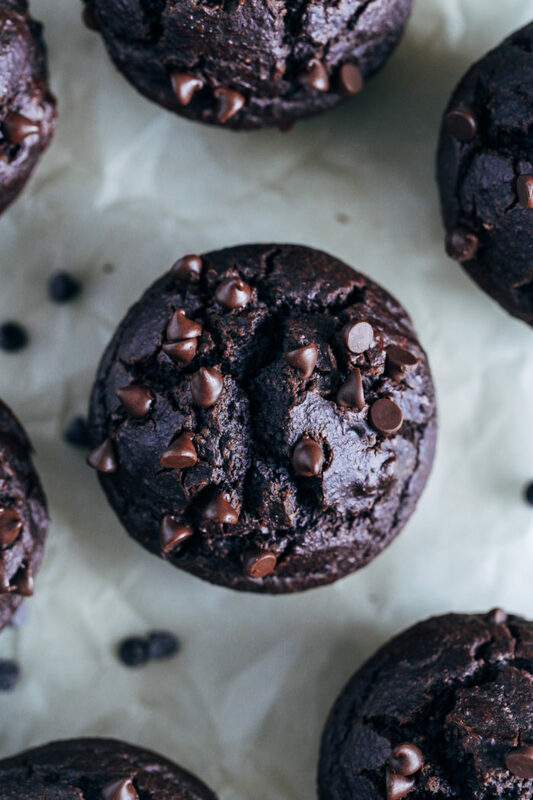 Dairy-Free Dark Chocolate Chips or Chopped Dark Chocolate: Double the chocolate, double the fun! Layer everything in the blender. Starting with wet ingredients first, place all of the ingredients except for the chocolate chips into a high speed blender. Blend! About 10 seconds is all you should need to get the batter nice and smooth. Add the chocolate chips. Sprinkle the chocolate chips into the blender and stir by hand until they’re well mixed. Pour into the greased muffin tin. Fill each one about 3/4 of the way full. Bake. Transfer to the preheated oven and cook for about 22 minutes. The tops will be nice and puffy with cracks. Stuff in face! Once you see and smell them, it’s going to be hard to resist but make sure to wait for them to cool so that you don’t burn your mouth. Don’t have a high speed blender? No problem! You can make these using equal amounts oat flour (2 cups) instead. If you have a regular blender you can a combine the wet ingredients and blend together so that the banana gets evenly distributed. Whisk the dry ingredients in a separate bowl then pour the wet into the dry. Fold in chocolate chips and stir to combine before adding batter to a muffin tin. Not into bananas? Leave them out and substitute 1 cup pumpkin or sweet potato puree. Want to make them nut-free? Use oat milk or preferred nut-free milk and replace the peanut butter with sunflower seed butter or coconut oil. Don’t like maple syrup? Most liquid sweeteners will work in it’s place, such as honey or agave nectar. I have not made these with stevia so I can’t offer any advice in that department. 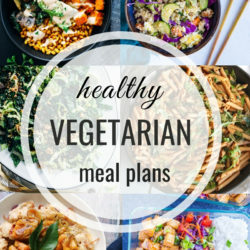 Want to make them vegan? I haven’t had good results replacing eggs with flax eggs in my blender muffin recipes. They often come out uncooked in the center. That said, my Flourless Vegan Double Chocolate Banana Bread would be a great alternative! 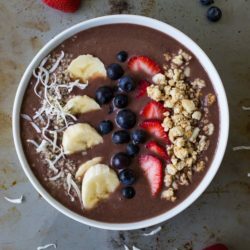 In a blender, starting with the wet ingredients first, combine everything (except chocolate chips) and blend for about 30 seconds, or until a smooth batter forms. Add the chocolate chips to the blender and gently stir together by hand. Pour the batter into the muffin tin so that each is approximately 3/4 of the way full. Sprinkle a few more chocolate chips on top then place them in the oven and cook for 20 minutes. Allow to cool for 10-15 minutes then enjoy! Store leftovers in an airtight container for up to 4 days. Be sure to use certified gluten-free oats for allergies. I couldn’t agree more on chocolate making things better! It may not solve all my problems, but I certainly won’t pass on eating them. 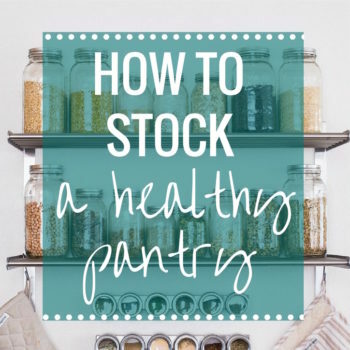 I love recipes involving ingredients I already have on hand! Definitely going to make these tomorrow night and I cannot wait :) Thanks, Sarah! Holy YUM! These look amazing!!! I can’t resist the chocolate peanut butter combo! Ohhhh man, these look good. I didn’t have my usual PB toast this morning, so I’ve got a crazy PB craving going on right now. I sort of jump on the healthy train in January, but it’s more like moving back to 80/20 instead of 50/50 lol. Gotta have chocolate in our lives! These looks perfect! I have been craving something chocolate :) Not bad for 200 calories either!! I love your recipes but I am allergic to coconut, what would be a substitute? Are you referring to this recipe or a different one? This one isn’t made with coconut. Hi Sarah, Just responding to your comment that there is no coconut in this recipe. You have something called coconut sugar in this recipe, i am allergic to the milk, pulp, oil, essence everything produced from it…i believe that something called coconut sugar is produced from coconut. In your other recipes you use it a lot as well, I am wondering what I can substitute coconut sugar or oil or milk with? Oh right, I forgot about that. I’m so sorry! You can sub coconut sugar in any recipe for organic brown sugar as they are very similar in flavor. For this recipe, you can use more maple syrup instead. Oh my goodness these sound and look so so good! Especially that drizzled nut butter shot. Mmmmmm that’s definietly the way I want to start my morning! I absolutely 100% agree that Mondays NEED chocolate! And I’d argue that January needs more chocolate too — all those antioxidants, right? 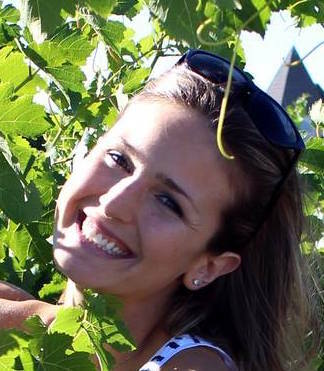 ;) These look great, Sarah! And you know you’ve got a winner when you can eat something for both breakfast AND dessert! These look wonderful! I need to get some bananas and let them ripen like your photo so I can make these beauties! Thanks for the post, and the picture of the ripe banana lets me know the stage I should use them for your recipe! 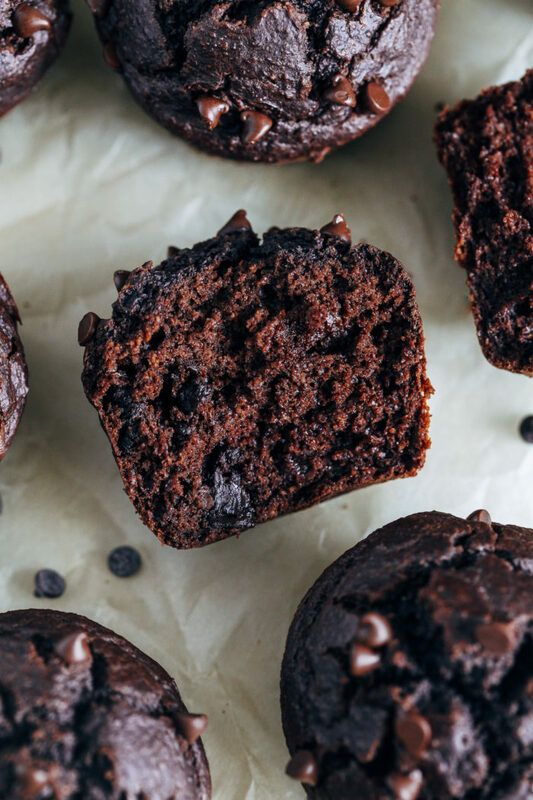 I’ve been craving those uuuuuge chocolate muffins from Costco lately, so I’m drooling over the idea of a healthier version that won’t make me curl up into a muffin coma. I’d say between your muffs and mine, we’ve got this whole clean muffin-ing thing figured out. High-fives all around! Perfect timing. My peanut-allergic husband (woo!) is away for work this week so of course I have been eating PB with every meal (incl Reeses cups for breakfast), but this seems moderately healthier…what with the oatmeal and almond breeze and bananas. Peanut butter, chocolate and banana?? I mean, yes please! I was craving something sweet last night like mad … I need to whip myself up a batch of these! Hope you had a great weekend friend!!! Oooh, I’m digging that rich chocolatey color! Will definitely make these babies very soon! 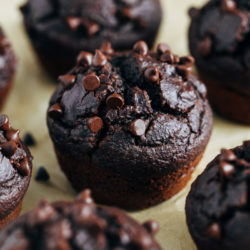 I love blender muffins and these are some of the best I’ve seen! I love everything about these and I think they would solve all my problems. Haha. They’re happening this week! Oh my goodness yum! These look amazing! I love all the ingredients! Great combo of flavors you’ve got here! these look so dreamy and delicious! You can never have enough chocolate for breakfast! One word…amazing! Thank you for the recipe. I made them this afternoon and they are so good. The best 200 calories I have spent in a long time. I was a little handicapped because my old blender needs to be replaced so I had to get creative and use my Magic Bullet to whip up the peanut butter, bananas and maple syrup. Then had another bowl going to whisk the eggs, vanilla, almond milk and yes, the sugar. The third bowl had all the dry ingredients…finally could put everything together in a large mixing bowl with the chocolate chips and stir well. Mine took a total baking time of about 25 minutes until they were done. Next time, and there will be MANY next times, I will use a new blender and this recipe will be a lot faster and streamlined, as you intented. 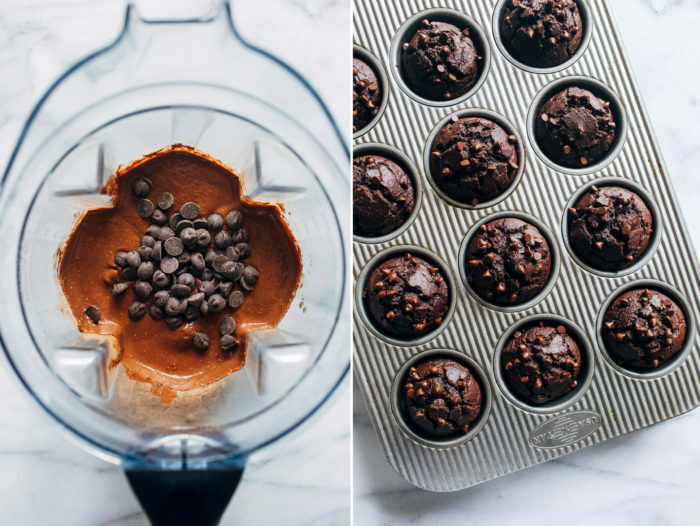 I made these on the weekend and they are really good and so easy to just whip up in the blender and pour into the muffin tin. My kind of recipe. Hope to see more of them. All of your muffins look amazing. I am trying to find a healthier snack for my college bound son, these look like they would be great. The problem is he has celiacs, but is also allergic to oats. Can you suggest a subsitute for the oats that might work for him. Thanks for any suggestions. 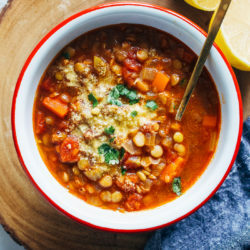 Just found your blog and I am loving the recipies. Hi Michelle! Thank you for your kind words. I haven’t tried this recipe with anything other than oats so I’m not sure what else would work. I’m sorry I can’t be of more help. I wish you all the best with your son! My husband had only one complaint, they were not sweet enough. I am not sure if that is because I used natural peanut butter (which one do you use in your recipe?) and 70% chocolate for the chocolate chips. I prefer desserts that are not too sweet, so I would not change it if it was just for me. I used unsweetened natural peanut butter. The level of sweetness is completely subjective though. I’ve had others say the recipe is too sweet as is. It all depends on the person. If someone is used to eating a lot of refined sugar then these won’t seem as sweet to them. But tastebuds can change with time, meaning that if your husband ate less sugar for a few months then eventually these might seem sweeter to him. made them again and they were perfect!! … I think I didn’t put as much sugar as the recipe initially called for the first time around. I do not have a blender. Will a hand mixer work? Hi Leslie! It might work if you use oat flour but not rolled oats. Then they will be more like oatmeal cups. I hope that helps! 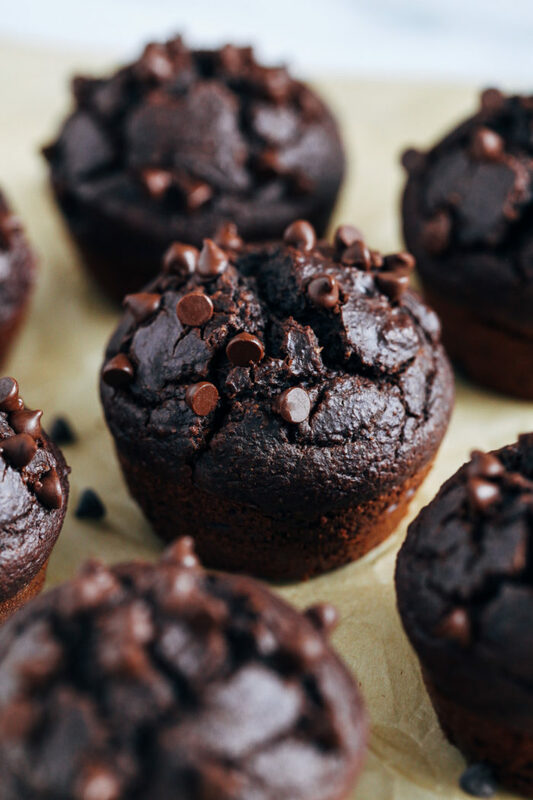 you muffin recipes are alway on point – this one looks so different! Is it even possible to go more than 12 hours without eating chocolate??? You had me at healthy and muffin. I’m all in for these. Loved these. my blender isnt super powerfull so i blitzed the oats on there own first. them made them as per the recipe. my 10 yr old daughter lived raspberries so half the batch got a few raspberries pushed in the centre just before baking. they are a hit. and if there are any left tomorrow they will be in lunch boxes. also made the apple and almond ones yesterday….going to chech out what other blender muffins you have….my kind if muffins!!! I’m so glad you like them! Adding raspberries is a great idea too. Thanks Rebecca! These are amazing muffins!! So tasty and dense and very filling! My go to now when trying to use up ripe bananas! Love making them in the blender, very little clean up!! I’m so glad you enjoy them! Thanks Sally! These look great. My bananas are not ripe enough but I have apple sauce on hand. Can they be subbed? If so, how much apple sauce would you recommend? Applesauce can be tricky because it’s acidic. Sometimes you have to adjust the amount of leavening to make sure it doesn’t fall in the center. They will probably still be edible but possibly not as fluffy and pretty like the photos. If I were experimenting I would try 1 cup applesauce in place of the bananas. Another option is ripening your bananas in the oven first. You bake them at 300°F for 30-40 minutes, until they’re blackened on the outside and soft to the touch. Just be sure to let them cool before peeling and using in the recipe. I hope that helps! I made these for my son to bring to his mini kindergarten as a Valentine’s Day treat. I used mini muffin tins and coconut oil instead of peanut butter. They were absolutely delicious even though I most likely over baked them. He brought 18 to school and we (mostly I) ate the remaining 30 within a day. I was waiting for my toothpick to be dry as I tested their doneness. Even after ten minutes extra it still wasn’t ( and this is for the mini muffin format) so I took them out. I guess this is normal. I would like to make them again. How can you tell when these are done? And do you think this recipe would work as a cake? Hey Sandra! I’m so glad you liked them! Honestly, I’m surprised to hear that they took longer to cook considering you made them into mini muffins…usually that would take less time. I don’t usually poke these to see if they are done. I just look to see when the tops are round with cracks and check to see if they smell done. I do all of this with the oven door closed. If you open the oven several times while they are cooking then that will keep them from cooking properly. I’ve also made these several times and they’re always finished between 20-25 mins. Maybe next time give it 25 mins before you open the oven door (assuming you didn’t do that the first time). Hopefully that will help! Hi again! So I just realized that I had typed baking powder in the ingredients when it should have read baking soda. I’m so sorry for the mishap! That certainly could have contributed to the inconsistent results. I just made the recipe and they are delicious. Question is it possible that the recipe is missing the Baking soda? I made a frist batch and realised that something was off, tasted delicious but they weren’t fluffly. Made a second one adding the baking soda and they are even more delicious. :) Thank you for your awesome recipes. i’ve made a couple and they are always spot on!!! These are fabulous! My kids loved them! Hi there! I made these muffins today and love them! I want to share them with my sister but her boyfriend is vegan, and the link in the recipe to your double chocolate banana bread isn’t working! Can you share that recipe again? 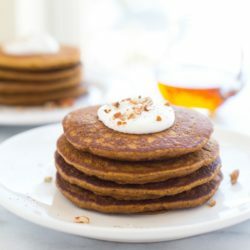 These look so good, and I love the idea of using maple syrup!! The recipe was updated recently and I removed the baking powder since it wasn’t needed. I’m glad to hear they turned out good for you! I am confused why there are so many recipes online that claim to be refined sugar free, yet they contain chocolate chips. Every chocolate chip I’ve seen contains sugar. Is there another brand I should try? There are many brands that are made with stevia (like Lily’s) or coconut sugar (Davis chocolate). You can also buy chocolate bars that don’t have sugar, finely chop them and use it in place of the chocolate chips. 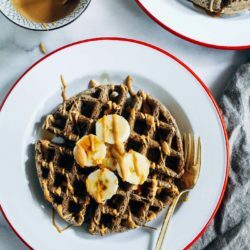 Curious if you’ve tried this with almond butter? 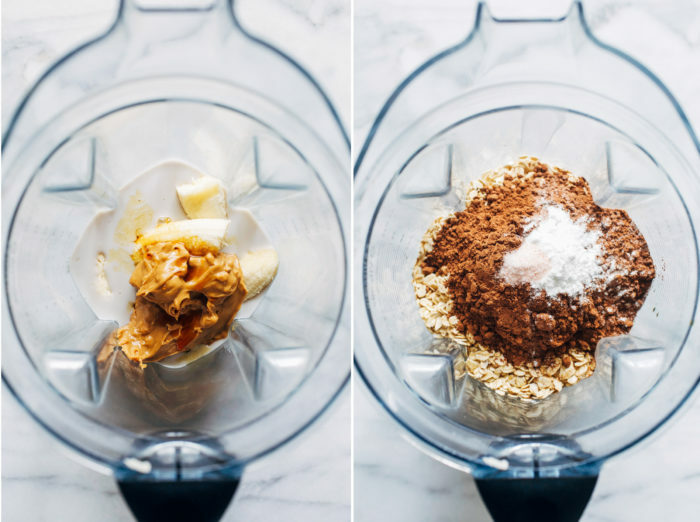 I love peanut butter, but have a ton of almond butter to use up at the moment! I haven’t but it should work just the same!